Following years of work, Professor of Biology Robert Jinks and his team have made breakthroughs in their research at Franklin & Marshall College. His most recent paper, published in The American Journal of Human Genetics, identifies and examines the link between mutations in CRADD, a protein involved in removing unnecessary neurons in the brain, and Lissencephaly, a disease resulting in a thicker than average cerebral cortex. His paper has since become the third most read scientific paper currently within the journal. In 2012, Jinks associated a mutation within the CRADD gene and the presence of Lissencephaly in Mennonite children. Lissencephaly, while not a devastating disease, does cause substantial learning disabilities. Patients often cannot sequence or complete multiple basic tasks within a span of time, which hinders independent living. Additionally, children with Lissencephaly often have IQs lower than 70. In 2012, Jinks hypothesized that if the CRADD gene mutates, limiting the brain’s ability to kill unnecessary cells in the brain, then the brain will be unable to develop properly, resulting in a too-large brain. Since then, other researchers have gotten in touch with the professor and proposed examining different mutations within the CRADD gene. In particular, Jinks and his students worked with Carol Troy of Columbia University, Department of Pathology and Neurology, where she studies Alzheimers and is one of the foremost experts on the CRADD gene. After partnering with other researchers in the field, Jinks had the opportunity to began taking and examining samples from patients, as well as running experiments with mice who were genetically engineered without a functioning CRADD protein. After working together, Jinks and the team discovered similarities between Lissencephaly and smooth-brain disease, a disease caused by limited brain surface area and often causes near vegetative states. Jinks explains, “[Lissencephaly patients] don’t have smooth-brain, but they’re approaching it. If they aren’t able to kill off enough neurons, the brain will continue to grow, creating a brain that is far too large.” A brain that is allowed to grow indefinitely, contrary to what some may think, does not result in a more intelligent person. Instead, an overly large brain often impedes general function. In the future he intends to work further with the patients’ cells in order to transform them into stem cells, and then again into neurons so that his team might be able to observe how the neurons are being eliminated and how they react to harmful stimuli. He also wants to find out whether the patients are retaining neurons that they shouldn’t by measuring their cells with a newer microscope. Working with him in the lab are several F&M students, including senior Briana Krewson, junior Jessi Stover, Becky Willert ’12, Alison Shupp ’16, and Agnes Czeja ’16. These students became “co-principal investigators” and they each become developing experts on one or two neurological disorders each. In order for the research to function, each student needs to comb through the scientific literature each week, this way the research can be as up to date and relevant as possible. 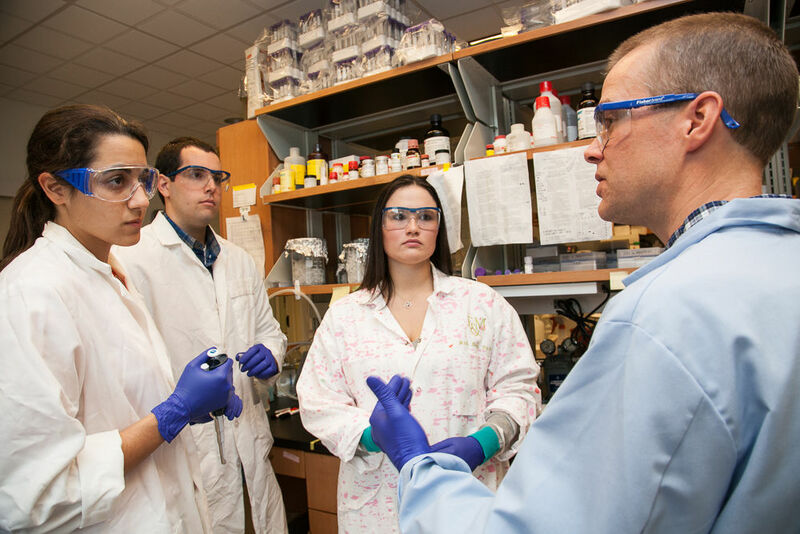 The students also learn alongside Jinks in the lab, eventually becoming nearly independent while working on complex and high-end scientific questions. Many of the students intend to go on to med school programs in order to continue biomedical research. Jinks’ research is largely funded by the $1.4 million HHMI grant, given in order to further scientific research. Junior Bridget Johnston is the News Editor. Her email is bjohnsto@fandm.edu.